Most people today can probably at least describe to you what a hoverboard is. This common knowledge is thanks to TV, movies, and the Internet. Hoverboards, also known as self-balancing scooters, were not really accessible to most people because they could not afford them. In the past, they were only sold for high prices. Nowadays, just about anyone can get a hoverboard by shopping around or doing a quick search online. A few years ago, the hoverboard market suffered from a series of problems related to bad batteries and manufacturer defects. In some cases, there were models that had problems with batteries exploding or the motherboard (logicboard) getting fried. The US Consumer Product Safety Commission had to get involved because there were also problems with warranties. Approval of hoverboard brands that are sold in stores and on the Internet must be certified at the state and federal level. You should always buy a hoverboard that has gone through rigorous testing and safety inspections. Any hoverboard you buy should also have a UL 2272 certification from Underwriters Laboratories. Since there are so many hoverboard brands and models to choose from, it is easy to get confused on which one may be suitable for you. To make things easier, we narrowed down the choices for you. Here are the top 10 best hoverboards for 2019. 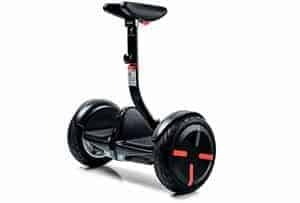 The Segway miniPRO looks similar to other types of personal transporters that you may be familiar with. What looks like too-short handlebars are actually height-adjustable ones which distinguish it from other models. Combined with a self-balancing wheelbase, riders have a great deal of balance and control. Just entering the hoverboard market 2016, this self-balancing personal transporter also comes with a mobile app control. If you are in the market for a self-balancing personal transporter that is hands-free, then this is the right hoverboard for you; especially when using the app on your phone. In addition, it has 10.5-inch wheels that are rubber inflated so they can handle uneven sidewalks or small rocks. There is no need to worry about falling on your face while riding over small objects. 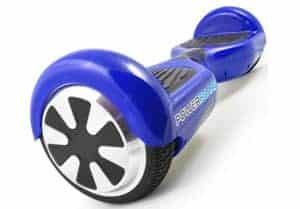 Other great features of this model are that it is also able to reach top speed quickly, it is more agile than most other hoverboards currently sold on the market, and it can easily be stored in the trunk of a car. One point that many riders do not like about the miniPro is its weight at 28 lbs. Although it is quite easy to pick up to store in a vehicle, this amount of weight can become a problem if you need to carry it across the street or take it up a flight of stairs. Although it is only 4 pounds heavier than most standard hoverboards, the extra weight can make a huge difference if it is being carried a lot. This hoverboard is designed for both beginners and experienced riders. Various features to include gear stabilization and a strong 250W upgraded motor are its biggest selling points. A durable exterior and going above and beyond in regards to safety standards are also notable features with this model. 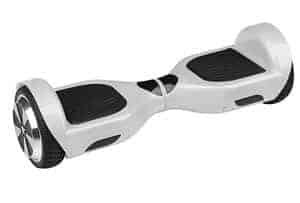 One of the big positives with this model is that you do not need any experience with this self-balancing hoverboard. It includes two separate speed modes for beginner and experienced riders as well as a practice mode. This model also comes in many colors to include black, white, pink, blue, red, and gold. It has a top speed of 8 mph and a maximum range of 12 miles which makes it competitive with other standard hoverboards. Some riders have complained about the controls saying that they are hard to get used to. It may be a good idea to cruise around in practice mode until you become more familiar using the Hoverzon. This hoverboard can reach speeds of up to 10 miles and travel up to distances of 10 miles with one single charge. With 8.5-inch tires, it can travel across terrain that would stop most other hoverboards. It can also climb hills with grades of up to 20°. This model meets IPX4 water resistance requirements and includes LED headlights which improve visibility not only for the riders but also for others who are traveling along the same terrain. This hoverboard is currently the only model on the market that has aluminum wheels and protective guards. Owners can also control this hoverboard using a smartphone app. With the app, riders can monitor speed, power, and distance traveled. The app can also adjust many other features to include the Rover’s speed and steering sensitivity. The downside of this model is that it comes quite heavy at 32 pounds. Once again, if you are someone who has to carry this hoverboard long distances, the weight may become a problem. In addition, with a 10-mile traveling range, this distance comes short compared to other models. The price is also somewhat higher than other hoverboard models in the same category. This hoverboard has a state-of-the-art design that reaches speeds of up to 6.2 mph and travels up to 50 miles in one charging. It uses American-made sensors to make sure that riders stay balanced. It also has a high-end lithium ion battery 2-3 hours of charge time. One of the main features of this hoverboard model is the app. Not only can you listen to music using the Bluetooth feature from your phone to the transporter, but you can also browse Google Maps to decide where the hoverboard should go. The head and tail lights are also a cool main feature because most hoverboards do not have one. It also has a safety feature that tells you that you are going to fast; which comes in the form of a danger message. One problem with this model is that it is not easy to ride. While balancing is easy when traveling at a slow speed, it gets more difficult as you go faster (most other hoverboards do not have this problem). Compared to other similar models, the high price is also a low point. It is also only available in two colors: black and white. Many people would like to see this model in a wider range of color choices. The main function of this hoverboard is to provide the rider with a self-traveling machine which can be taken anywhere. What makes this model special is that it makes riding more challenging and fun with its off-road features. This hoverboard can cover distances and places that others cannot because of tough surface conditions. 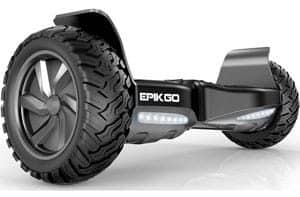 The EPIKGO also includes 400W dual motors which make the hoverboard powerful when climbing steep slopes as much as 18°. On a single charge, it can last over one hour at a top speed of 10 mph. In 2017, this model is one of the most powerful balance boards available on the market. In addition, this product is unique in sophistication using a built-in 2-hour fast charging technology. This model is also 30% larger and weighs 32 lbs. Another key feature is that it is two times more powerful than any competitor. There are a lot of great qualities that come with this hoverboard. It is extremely sturdy, tough, and allows for smooth traveling on all road surfaces and terrains. Due to its big size and powerful motors, the board also provides great balance. It is also water resistant and comes with LED lights on both the front and back. There are also a few downsides with this model. Its big size and weight are a problem for some people. For example, some people may find it tough to transport easily because of its large size. Kids may also have trouble with the weight. There is also a minimum weight limit of 44 pounds which can be an inconvenience. There are also no Bluetooth speakers with the EPIKGO. 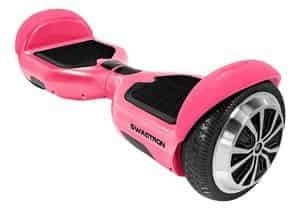 This hoverboard was upgraded for 2017 and comes in black, white, blue and red, gold, or pink. 4.5-inch diameter wheels and 6-inch wide foot pads help make this device feel very stable. On the front and back, there are big multicolored LED lights that turn blue, red, or green. A huge improvement with this model is a graduated battery indicator with five lights. On the bottom, a small fabric loop can be used to carry the scooter. Since this model only weighs 22 pounds, it is a lot easier to carry than other hoverboard models. One great thing about this model is that it has a stylish look that is long-lasting because it comes with a durable shell that is hard to scratch. It also has a very impressive smartphone app and offers different riding modes; so each person has their own speed limit. The learning mode is also useful for beginners and children. 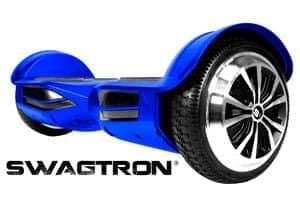 The SWAGTRON T3 also comes with Bluetooth speakers so that every ride is enjoyable. One downside for this model is the price. 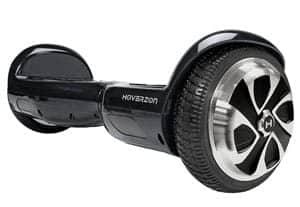 Some people consider the price for the SWAGTRON T3 to be a little expensive when compared to other hoverboards on the market. There is also a pro riding mode which anyone can access. This feature is not safe because it allows a rider to travel at very high speeds. Swagtron put out a disclaimer stating that users will take responsibility for their own actions when using this product. However, if you read the manual and follow the instructions, you should have a great riding experience. UL 2272 certified in the US and equipped with advanced self-balancing technology, the Powerboard by HOVERBOARD is considered one of the easiest and safest hoverboards on the market. It is extremely easy to ride and riders can learn how to balance and maneuver in less than five minutes. Manufactured in China, this hoverboard is made of premium materials and components that were engineered to last. The big seller with this hoverboard model is its 6-hour battery life; this is longer than most other brands on the market. It also comes in four different colors to choose from: blue, red, black, or white. 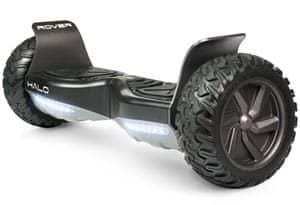 One problem with this model is that there are often fakes of this model sold on the market, so it is important to make sure that you are by genuine HOVERBOARD product. Many customers online have made complaints about buying a fake Powerboard by HOVERBOARD from unauthorized sellers, so be careful. 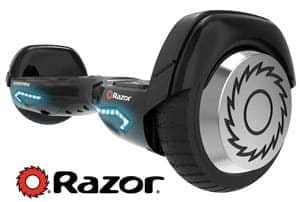 Made of high-quality plastics, the Razor Hovertrax 2.0 is scratch and shatter-resistant. It also runs very quietly; it is so quiet that users do not even know that it is on. The 250W dual motors also keep the hoverboard in continuous balance. It is also lightweight which makes it portable and easy to carry. One of the features that need improvement is how its overall speed. With a max speed of 6 mph, this is the slowest hoverboard on the market. Other bad points include the battery taking up to three hours to charge which is quite long. It is also not waterproof and does not have the ability to jump curbs. This hoverboard is considered the best entry-level, self-balancing personal transporter. With a cruising speed of up to 7 mph and a travel distance of 7 miles, the T5 is for you if you prefer to not get the bigger, fancier hoverboards. Using gyroscopic technology, stopping and steering is controlled by your balance and makes the T5 easy to operate and control. This is probably one of the best hoverboards for a beginner, especially kids and others who would prefer a smaller sized hoverboard. 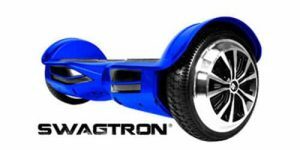 The Swagtron name is probably more recognizable any other hoverboard brand on the market which means you get a high-quality hoverboard for a reasonable price. More experienced boarders will probably not like the T5 because it lacks in top speed and travel range when compared to other hoverboards. It also carries a lower max load of 187 lbs, which is lower than the 220 lb average weight that most hoverboards can carry. New and improved for 2017, the T1 sets the standard for all hoverboards present and future thanks to Swagtron’s focus on user experience and safety. This model is available in five colors: white, black, blue, pink, dark red, or gold. With a top speed of 8 mph and a 12-mile range, this is one of the most popular models sold today. With the patented Swagtron SentryShield, there is no better safety and protection for a rider than the T1. 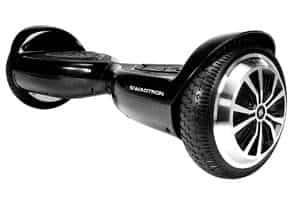 It also includes a complete range of features which make riding this hoverboard stylish and fun. The only downside to this model is that the fireproof plastic used to make the hoverboard can be easily cracked. It is a good idea to buy a bumper guard for this model. The best thing about the selection in this top 10 list is that the makers of all of these brands ensure rider safety. In the past, hoverboard safety was a huge concern, but now the government and companies have taken more steps to improve buyer safety. As of now, all hoverboards must show a UL 2272 certification. If you cannot find one, do not buy that product. Some companies even go a step further and offer added protection with a UL 2271 listed Sentry Shield. Max speed, travel distance, carrying weight, and charging time should also be important determining factors when making a purchase. Lastly, you should consider your own personal needs when making a choice from this list. Whether you are a beginner, a child, or an expert rider, there is a hoverboard for every rider level so that everyone can have a safe and fun ride.